What’s Your Name? Is It Bronco or Bronx? My dog’s name is Tebow. No, it’s Bronco. No, wait a minute, it’s Bronx. New York Jets quarterback and former Florida Gator QB, Tim Tebow is hard at work with his new teammates. But the real news, making headlines right now, is the fact that he changed the name of his dog from Bronco to Bronx. Some dog and football fans are concerned the Rhodesian Ridgeback could become confused, even sighting concerns on Twitter that Tebow is a bad dog owner. Some are weighing in, saying it’s cruel to change a dog’s name. But, re-naming a dog is not an unusual occurrence. How many families have changed the name of their newly adopted dog after bringing him or her home from a shelter? Heck, dogs adapt to new names, just like football players adapt to new teams. For dogs, it’s love+food = adaptation. For football players it’s adulation+money = adaptation. 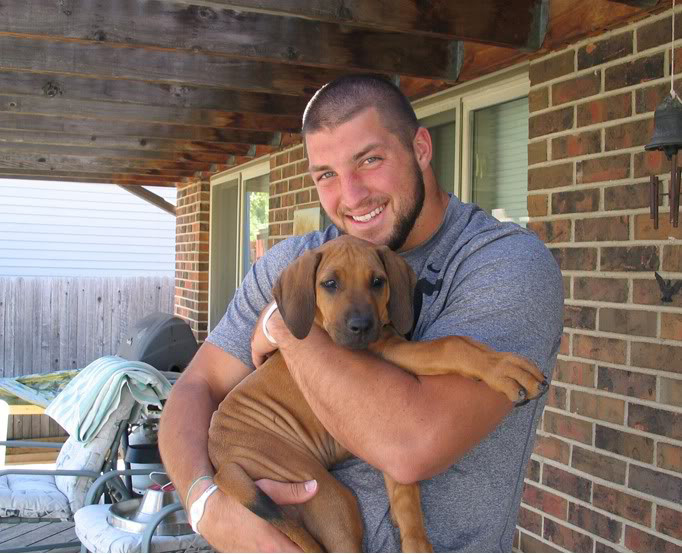 At least Tebow isn’t adding tattoos to his dog’s body a la LaDainian Tomlinson. Previous Previous post: Art for the Sake of Dogs. Next Next post: Fix At Four Advertising Campaign Targeting Dog and Cat Owners.